As you know if you've been coming here regularly I love visiting the WWI sites around Ieper (Ypres), Belgium and northern France. I was back there last week, visiting cemeteries and experiencing the region in winter. It was pretty cold and the thought of living in a trench in such weather is way below unappealing. One of the planned stops on the tour was Lijssenthoek Cemetery, which is near Poperinge, Belgium. It's a British Commonwealth cemetery, but as soon as I walked through the gate my eyes were drawn to a sight I hadn't expected: three graves with American and Belgian flags. Three Americans buried in a Commonwealth cemetery with 10,000 graves. Why? Who were they? Although most of my interest in WWI has centered on the Irish involvement, the American in me couldn't ignore what I was seeing. I noted the names of the three men and went looking for their stories over last weekend. 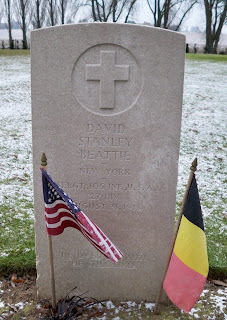 One of the graves was Sergeant David Stanley Beattie, who was killed on August 31, 1918. He was from Troy, NY, which is not far from where I grew up. His regiment - the 105th Infantry - was one of the first American units in Belgium. He was killed on August 31, 1918 and buried in Lijssenthoek, but at his family's request he was left in Lijssenthoek and not moved to an American cemetery. Lieutenant James Pigue from Tennessee is also buried there. He was killed on July 18, 1918, presumably leading his men out of the trench. In 1921 Pigue's father traveled to Belgium to visit the grave and after being assured by the British authorities that they would "care for the grave in perpetuity" he asked that his son's body not be disturbed. The third grave was Pfc Harry King and his story was the most intriguing, but also the saddest because inscribed on the gravestone was, "Best of Sons and Brothers, Also Reggie Buried Close By." I couldn't see any other American graves and didn't know what to make of that bit about his brother Reggie. However, it turns out Harry was originally from England and emigrated to America. His brother also left England, but for Canada and they both ended up in the war and both died. (Harry of pneumonia, Reggie killed in action). Their mother asked that Harry's body be moved from the American Meuse Argonne Cemetery to Lijssenthoek so that the two brothers could be together again.